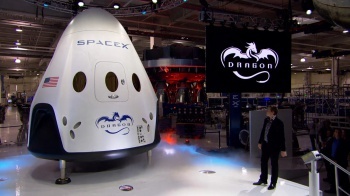 Privately owned space transport service SpaceX unveiled the Dragon V2 on livestream, a new spacecraft that will ferry astronauts to and from the International Space Station. Billionaire founder of SpaceX Elon Musk tonight revealed the Dragon V2 on livestream from his company's California headquarters. Musk explained that the V2 will be able to land anywhere on Earth with the accuracy of a helicopter, and will be capable of carrying seven astronauts for several days. "It's a big leap forward in technology," said Musk. "It really takes things to the next level." Another technological leap comes in the form of the craft's new SuperDraco engines. The original Draco engine produces 100 lb. of thrust; each of the two SuperDraco engines produce 16,000 lb. of thrust. Further, the Dragon V2 is capable of autonomously docking with the ISS, without needing the station arm. Dragon V1 requires the Canadarm. The American flag was proudly emblazoned on the Dragon V2, along with a slick dragon logo. Musk explained that the design team wanted to keep the interior very clean, with a simple aesthetic. That clean look, coupled with the various large-screen monitors with a clear GUI gave a very sci-fi look to the craft, something that wouldn't look out of place in Star Trek. The Dragon V2 is a modified version of the Dragon spacecraft that has performed three unmanned missions to the ISS since October 2012. NASA hopes to have the craft ready for manned missions by 2017 or 2018. NASA's space shuttle program was retired in 2011, and since then, the United States has relied on Russia to ferry its astronauts to and from the ISS at a cost of $60 million per person. In late April, due to heightened political tension between Russia and the United States and sanctions imposed by the latter on the former due to actions taken against Ukraine, Russia's Deputy Prime Minister Dmitry Rogozin threatened to stop letting the U.S. make use of its space shuttles. "The United States introduced sanctions against our space industry... We warned them, we will reply to statements with statements, to actions with actions," Rogozin wrote on Twitter. "I propose that the United States delivers its astronauts to the ISS with the help of a trampoline." Apart from SpaceX, Boeing and Sierra Nevada Corp. also have contracts with NASA to construct space taxis. It seems the U.S. won't need a trampoline after all.